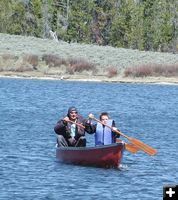 Pinedale Online > News > May 2005 > Green River Lakes is open! Campground closed Green River Lakes Campground is CLOSED until July 1st for tree felling operations. Shooting Stars Wildflowers are starting to bloom. Pink, purple and white phlox, yellow buttercups, white daisys, violet shooting stars and more. Elk are out Elk can been seen in the meadows as they eat the new green gras. Soon they will be working their way to the high country. Road in is mostly dry Watch for bumpy washboards and a couple of soft, muddy spots in shady areas. Green leaves These trees went from bare winter trees in the early morning to starting to leaf out by the same afternoon. Spring is here! Green River Lakes is open! The Green River Lakes road is open, and it is BEAUTIFUL up there! We scoped it out over the weekend to see how the road is doing and anything else you folks traveling from a long ways away might want to know before making the trip. * The road is mostly dry (a few soft/damp spots, but nothing serious), and side roads are dry enough for campers and RVs to get to their favorite spots on high ground, for the most part. Low lying areas right near the river are still soggy, so better to keep to higher ground for river access and camping on the two-track back roads. The main road hasn’t had its annual blading, so it is rough and washboarded. Take it slow and easy (watch for elk and moose grazing along the side open areas) and you won’t rattle your teeth out on the drive up. * One important note: The Green River Lakes Campground is CLOSED until July 1st while the Forest Service removes more hazard trees and cleans up debris from the logging. There are a lot of beetle-killed trees in the area, and it is important to get those out of there now. * The trailhead access and boat launch areas are OPEN. Restroom is open. 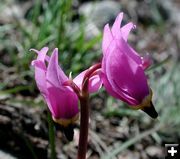 *There still are some patches of snow in shaded areas around, but for the most part, it is really spring now. Lots of wildflowers in bloom. 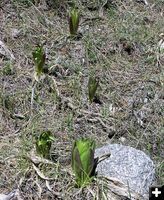 The Arrowleaf Balsamroot are starting to come up and will turn hillsides into fields of yellow in a couple of weeks. * LOTS of wildlife to be seen by those who take the drive slow and are on the lookout. We saw two elk, in two different places. One by the river at the old cabins on the left and the other just south of the elk feedground. 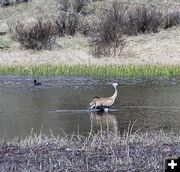 We also saw antelope, deer, a lot of different kinds of birds, waterfowl on the many ponds, and two different pairs of nesting sandhill cranes. * Whiskey Grove Campground road is open and dry. The big snow bank on the usual last bend is all melted off. The hand-pump has water. Be sure to boil the water for 10 minutes before consuming. Restrooms are open. Safety note for those with small children and pets at the campground. The Green River is very swollen right now with runoff. The water current is extremely swift, so watch kids and pets carefully around the river’s edge. * Dollar Lake is accessible and people are catching fish from boats and the shore. There still are some snow banks on a couple sides of the lake, but things are fairly dry for parking and walking around most of the lake. The favorite dispersed camping spots on the other side of the lake are already being nabbed by early campers and fishermen. * Green River Lakes is awesome and beautiful as always. Anyone who knows the Green River Lakes road knows what I mean. That view coming around the last bend in the road to where you can see White Rock and Square Top Mountain is absolutely breath-taking. That is one view that always has an emotional effect of erasing all cares in the world with one glance, inspiring awe and refreshing one's respect for the hand of nature all at the same moment as you take that drive and round the bend where Square Top comes into view. Food for the soul. * The Green River is high with runoff, but not over the banks, and the water is swift and somewhat muddy. 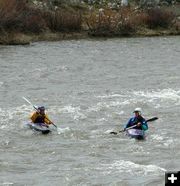 The experienced kayakers are loving the high water and rapids; the fishermen are sticking to the lakes. * There still is plenty of snow in the high country. The lower trails are walkable, but hikers will run into snow pretty quick with elevation gain. Expect to find muddy trail conditions in places, high water at stream crossings and occasional trees across the trail from winter fall-down. Trail crews have not even begun to work their way through the system, so early hikers will have to take conditions as they come. * So far, minimal bugs, no mosquitos or biting flies. * Spring literally sprung on Saturday. On the way up, all the aspens by Black Butte and The Place had their usual winter stick look. On the way back, bright green leaves could be seen on the very same trees. The temperature in Pinedale has been hitting the 70s. It’s a bit cooler with the elevation gain further up the valley, but it still is warm enough to have triggered the leaves on bushes and trees now. This is an incredibly beautiful time of year to take a day drive and enjoy spring unfold in our valley. Birds, wildlife, wildflowers, green grass, snow-capped mountains, incredible blue sky. Picture perfect. * Spring is here! If you come with an RV, prepare to dry camp in one of the dispersed areas until the campground opens up on July 1st. Also, just a reminder that here in the high country, spring can turn to winter again in the course of one day. We’re still in early spring conditions and we can’t promise we won’t get another last ditch snow squall if you come up from California expecting it to stay this way. Today is 70 and we’re in t-shirts and shorts. Tomorrow it could turn into winter again with 5" of snow on the ground. Be sure to bring clothes to layer and throw in a couple sweaters and a coat for cold nights and when Wyoming weather reminds you this is the heart of the Rocky Mountain high country. * If you happen to think of it, drop us a note here at Pinedale Online and tell us about your trip and the fun you had while you were here! We love to hear the stories of what folks did and what they saw. E-mail: support@pinedaleonline.com. Fish are biting The fish ARE biting. But even if they weren't, who cares with a view like this! Another elk This elk was grazing over the hill from the elk feedground. We saw two elk on the drive in, several miles apart. Both were easily seen from the main road and weren't too concerned that we were watching them. That will change soon and they'll be more elusive. 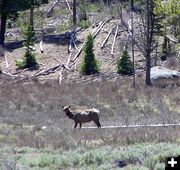 Spring is a great time to get a chance to observe big game wildlife on day drives around here. Arrowleaf Balsamroot sprouts In another couple of weeks, the balsamroot will be blooming and turn hillsides into colorful yellow wildflower fields. The Green is high with runoff The water is high and the current is swift. Kayakers having fun These kayakers were enjoying the rapids on the Green River on Saturday. Kayaking the Green River The Green River is fast with great rapids for kayaking. 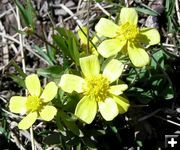 Yellow Buttercups Wildflowers blooming everywhere, and more will be coming soon! Fishing Dollar Lake The fish were biting at Dollar Lake. 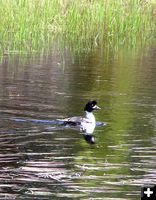 Barrows Goldeneye There are many species of waterfowl on the numerous ponds along the drive up to Green River Lakes. This is a bird-watcher's delight day trip. Green River Late May on the Green River. Things are starting to green up, willows are budding out. Water is high with spring melt. Willow buds The willows are budding out along the Green River. Sandhill Cranes A sandhill crane lands beside its mate on their nest alongside the Green River. Whiskey Grove Campsite Whiskey Grove Campground is open. Located next to the Green River, this small campground is tucked away in a grove of trees along the way on the Green River Lakes road. Hand Pump for Water Use the handpump to get water at Whiskey Grove Campground. Be sure to boil the water before drinking. Boil the water Boil the water before drinking it at Whiskey Grove Campground. Green River high runoff The Green River is running high and fast by Whiskey Grove Campground. Watch small children and animals near the water's edge. Colorful wildflowers Spring rains have brought colorful wildflowers to the Upper Green River Valley. Dollar Lake Dollar Lake is a primitive fishing access site, with limited parking, along the way to Green River Lakes. Dollar Lake Fisherman Fishing Dollar Lake on Saturday. 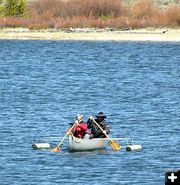 Pontoon boat People used canoes, float tubes, drift boats and pontoon boats on Dollar Lake Saturday. Relaxing at Dollar Lake Mary Ann, from Rock Springs/Boulder, relaxes with the dogs and a good book while the others are out fishing at Dollar Lake on Saturday. Snow bank ice bergs There are still some big snowbanks on one side of Dollar Lake, that are sloughing off into mini-ice bergs into the lake. These will all be gone soon with the warm weather. Dog Day at Dollar Lake Saturday was a warm, sunny, lazy type of day, and seemed like everyone was out enjoying the nice spring day with their families and the dog. Kendall Warm Springs Kendall Warm Springs is on the way to Green River Lakes. 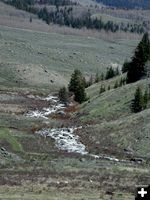 This is the home to the Kendall Dace, an inch-long fish that lives only in this short stretch of warm springs that flows over a waterfall into the nearby Green River. Stinky Springs Stinky Springs is one of the geothermal features that can be seen on the way to Green River Lakes. It, and Kendall Warm Springs, are all part of the Greater Yellowstone interconnected geology. The milky water in the springs has a distinctive sulpher rotten egg smell. Union Pass Road The Union Pass road junction is dry in the valley. There still is snow at the top. Roaring Fork Roaring Fork tumbles down the mountainside into the Green River. Sandhill Crane Sandhill crane in the Green River. Gros Ventre Lodge The Gros Ventre Lodge was one of the earliest dude ranches in Wyoming, built in 1897. It was a summer and hunting lodge, operating until 1906. 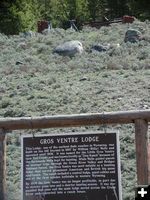 The historical sign and building remnants are beside the road on the way to Green River Lakes.